Gershon Kingsley composed 'Popcorn' as an instrumental tune. Still, there are a few vocal versions of this track, and the first one was recorded by Anarchic System in 1972. Anarchic System was a French band. Early singles 'Popcorn' and 'Carmen Brasilia' were very much influenced by electronic music, although later work is influenced more by the rock genre. 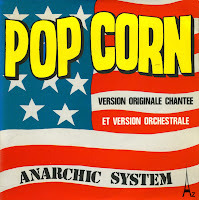 For the longest time, I didn't know that there was this vocal version of 'Popcorn', all I knew was that Anarchic System recorded 'a version' of Kingsley's composition. I found out shortly before I found my copy at a Dutch record fair. Although I prefer the instrumental version on the B-side of this record, it's still a great rarity.